On April 7, La Cata celebrated our first year of business with more than 50 friends, colleagues and guests from throughout Mexico and North America. Our first year has been an undeniable success, despite being a very new concept for the town of Tequila. It was a true pleasure to share a celebratory evening with the community who has made that possible. When La Cata opened on April 7, 2017, it was with the express commitment to be more than just a bar. We vowed to be an objective source of agave knowledge and appreciation, representing the entire category of 100% agave tequila without prejudice for particular brands. We invited the industry as a whole to see us as their living room: a place where brand owners, distillers, and industry-at-large could break bread, try each other’s products, and engage in friendly debate over drinks. We also challenged ourselves to participate in bringing craft cocktail culture to the town of Tequila, while participating in the betterment of the community that has brought so much into our lives. After one year, we humbly believe that we have achieved these goals. We have served over 3,000 guests from a total of 25 countries representing every continent. These guests have ranged from people timidly trying tequila for the very first time, to global brand ambassadors, master tasters and distillers, and aficionados making their annual pilgrimage. Their enthusiasm for La Cata and appreciation of our staff’s daily commitment to hospitality has made us the number two “Thing To Do” in Tequila on TripAdvisor, with a perfect record of all five-star reviews as of the anniversary. Being the first totally brand-independent tequila bar in Tequila, some of our local friends questioned the viability of the concept, or even our ability to maintain that type of neutrality. Those same friends have seen that we have stayed true to that vision, and La Cata’s role as the ‘Switzerland’ of the industry is becoming better known every week. In the past twelve months, we hosted nearly thirty master distillers, brand owners, or global brand ambassadors from tequila and mezcal brands throughout Mexico and the world. Their feedback has been invaluable to us, and it is a genuine source of pride to see these leaders and experts trying each other’s brands for the first time, shaking hands, and bridging the gap that sometimes exists between the Valley and Highlands regions of Jalisco, and between the tequila and mezcal categories. A striking example of this occurred doing the anniversary party itself, when Felipe Camarena (owner and producer of G4 and Terralta tequilas) and Eladio Montes (co-owner and producer of Tequila Don Abraham) found themselves sitting next to each other at the bar, struck up conversation, and passionately discussed the merits of each other’s tequilas, as well as the current agave price situation. This was a moment that exemplified exactly why we opened La Cata, and a source of true pride for our entire team. 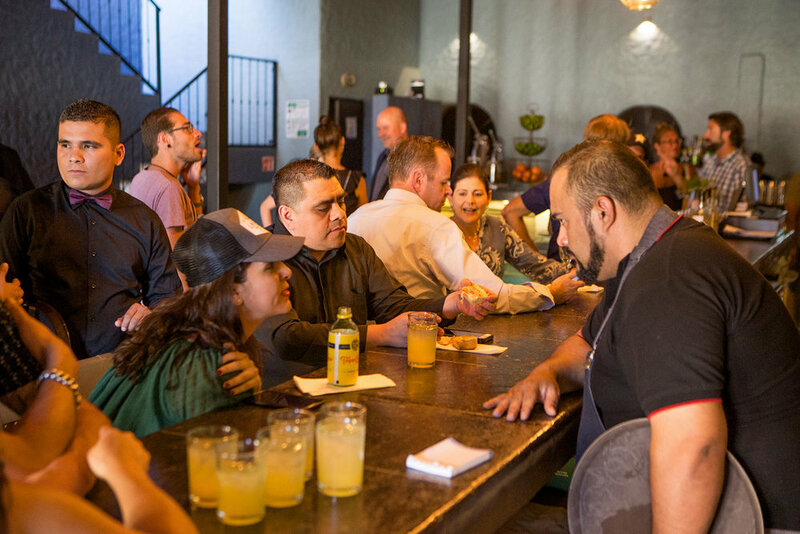 Our commitment to raising the standards of hospitality and cocktail culture in Tequila extends beyond the walls of La Cata, and we have been able to join forces with our local colleagues and neighbors several times in the past year. Together with Grupo La Posta, La Cofradía, and Hotel Los Abolengos, we brought US cocktail bartender Kami Kenna to teach two in-depth cocktail courses to staff from various local bars and restaurants, including La Cata. We have also been honored to contribute in a small way to the José Cuervo Foundation’s non-profit program to teach handicrafts to local low-income women, providing them with a crucial extra source of income. In the coming year, we look forward to deepening these relationships as well as building others with our neighbors and colleagues. The Rey Sol… is SOLD OUT.